O earth you are the starting point, the track finishes in the heavens. 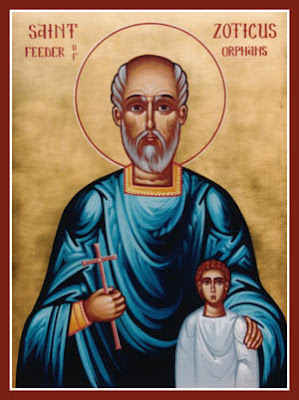 This Saint lived during the reign of Constantine the Great (306-337). He was born in Old Rome to an honorable and illustrious family, and was educated in every form of wisdom from a young age. Because he was astute and sensible, he was invited by Emperor Constantine the Great to move to Constantinople, and he was honored by him with the office of the magistrate. 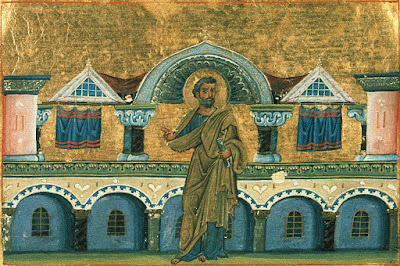 In the company of Saint Zotikos there also went other leaders from Rome to Constantinople, including the so-called magistrate of arms, Paulinus his nephew, Olymbrios, Beros, Severos, Marianos, Anthimos, Urbicius, Samson and Stoudios, whose names until today are commemorated on the public buildings they themselves erected. It is said therefore that around that time the so-called "sacred plague," namely leprosy, came to Constantinople, and because it is contagious the emperor issued a decree that whosoever bears this sickness was to be thrown into the sea, so as not to transmit it to others. Such a decree could not be accepted, seen or heard by the sympathetic and kind Zotikos. Therefore he became inflamed with divine and brotherly zeal, and he went to the emperor and said: "May the emperor give me his servant much gold, for the purchase of precious pearls and radiant stones, to the glory and honor of his authority, since I have much experience in these matters." The emperor ordered that as much gold as he needed be given to him. 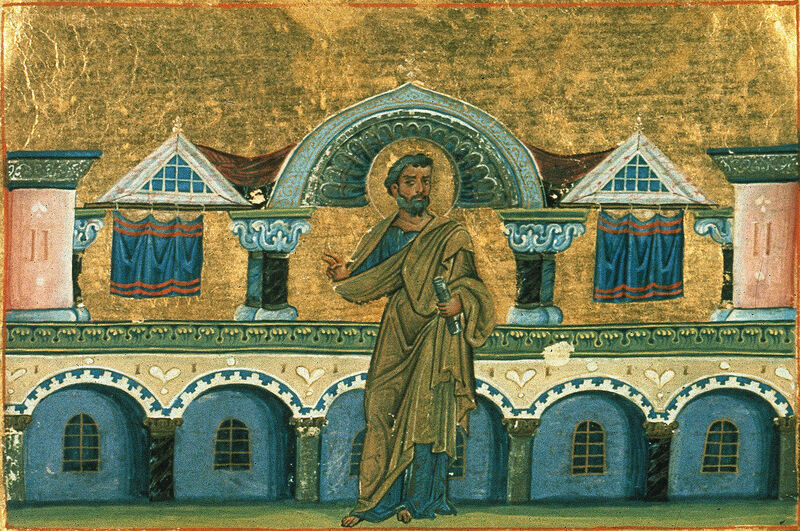 This lover of God and lover of men, and the most approved keeper of the commandments of God, Zotikos, took the gold, and left the palace with joy in his heart. And how did he manage it? He found the executioners who were taking the lepers with the permission of the ruler of the city to cast them into the sea, and he bribed them with gold, thus ransoming all the lepers from drowning in the sea. Then he took them to a place beyond Byzantium, to a mountain which at that time was called Elaion (Mount of Olives). There he built tents and huts, where he would give rest and pay visits to the lepers. This divinely rewarding affair which the Saint managed could not be hidden from the population. Furthermore because the lepers were many, and the expenses given by the emperor to this was very much, it was because of these expenses that the population thought famine would come to Constantinople. Because Constantine the Great departed for the other life, his son Constantius took over the entire Empire of the East in the year 337, and he was neither pious nor orthodox, but subscribed to the Arian heresy. For this reason he punished many Orthodox, because they would not accept this cacodoxy. Therefore he turned away from the blessed Zotikos, because he was Orthodox, even though his father Saint Constantine revered him for the love he showed towards him. On one occasion he held anger and enmity against him, thinking that through Zotikos the disease of leprosy spread throughout the city. It occurred that the very daughter of the emperor came down with it, and her own father gave her over to the ruler of the city so that she may be thrown into the sea. 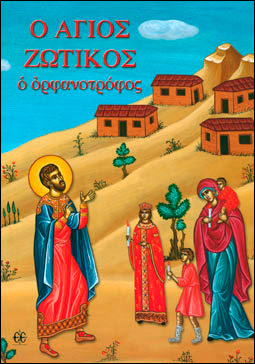 Saint Zotimos, having given the customary bribe to the executioners, purchased the daughter of the emperor and numbered her among the other lepers. It followed that with the permission of God the feared famine came to Constantinople, and the city lacked the necessary foods, for this reason the emperor sought to learn what caused this famine. Slanderers and the enemies of truth seized the opportunity to accuse the blessed Zotikos before the emperor. And they assured him that Zotikos was the cause of the famine, since he distributed richly and bounteously of physical necessities to the numerous crowd of lepers. When the emperor heard this information, he kept it to himself for a short time and did not act with rage upon it. For he had some reverence for the Saint and drew back, as we said earlier. Moreover he did not enjoy the pearls and precious stones that he had promised to buy. Malignant men however pressed him to have Saint Zotikos arrested. When the Saint found out about this, he secretly went to the royal palace with eagerness, and entering inside he presented himself before the emperor. "Has the ship come, O magistrate, which has brought the pearls and the precious stones?" The Saint responded: "Yes emperor, it has come. Therefore if it is your decree, come with your servant to see them." Without delay therefore the emperor hastened along with him. The blessed Zotikos went before him, and told the leprous brethren to come out of their huts along with the daughter of the emperor, holding lit lamps in their hands, that they may greet the emperor. When the emperor arrived at Mount Elaion, and beheld the lamp-bearing lepers, he was astonished by their great number. "And who are they? he asked. And Zotikos, pointing with his finger, replied: "These, O emperor, are the stones beyond precious, and radiant pearls, which I purchased with great labor." The emperor thought that he did this to mock him, so he became enraged. Then he ordered that the Saint be mercilessly bound to wild mules, and they were to be spurred to run over the rocks found there, so that by being dragged over them the members of his body would be cut to pieces, and in this way the Saint would be violently separated from this present life. The mules were therefore lashed and goaded, while the emperor watched them violently and rapidly - alas! - drag the Saint down the mountain. In this way all the members of the renowned Zotikos were scattered here and there, and his eyes were utterly destroyed. At the place where these things took place however, there gushed forth a spring of clean and fresh water, which heals every disease, no matter how long they may have had it, and every sickness, no matter how short they have had it, to the glory of the loving and compassionate God, and the praise of His healer Zotikos. 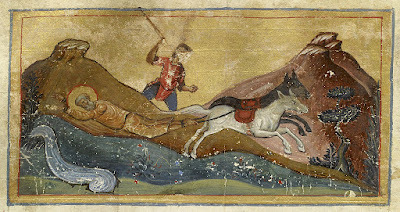 When the Saint delivered his soul into the hands of God from being dragged, then the mules immediately stood in place motionless, although they were harshly lashed by the soldiers. And not only this, but, - O the strange wonder! - with human voices the mules loudly cried out for everyone to hear, the censuring of the emperor for his brutishness and irrationality, calling him blind and senseless. Then they revealed that the relic of the Saint was to be buried at that very spot. When the emperor saw and heard this, he was astonished and beside himself. Thus with grief and a broken heart and bitter tears he begged the Lord that He have pity on him, crying out that all these things he did out of ignorance. And he immediately ordered that the body of the Martyr be entombed with much care and exceeding honor. Also he ordered with urgent haste, that a large building be erected to give rest to the lepers, to be paid for with imperial funds, and that it be given much land and revenue. The honorable relic of Saint Zotikos, from that time until the present, does not cease to wondrously work an infinite amount of miracles through the grace of God Who loves mankind. His Synaxis is celebrated in the apostolic Temple of Saint Paul, which is found in the Orphanage.